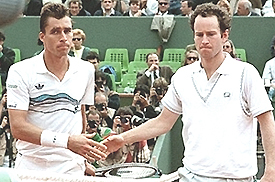 I almost missed the6am Mac/Lendl French final in 1984, despite a vested interest. Remember longing for a world in which you could follow the major events in tennis on television and actually see what was happening before the final couple of days? Well, we've come to the other end of that paradigm now haven't we? The sources, choices, platforms, schedules--it's all become (at least for me) a little overwhelming. (OK, way overwhelming.) It's seems like a full time job sometimes to just keep track of what you can see when and how. And now to say you can see every minute of every pro match at every event all year in one form or another, isn't that far from the truth. The Tennis Channel: your television source for the first 6 days. The recent release of the Indian Wells BNP Paribas broadcast schedules shows how this is true. 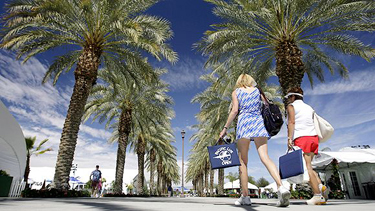 If you have ignored my advice to attend--or maybe you just don't quite have the time to spend a full 10 days in Indian Wells--let me lay out your options for media viewing over the course of the tournament. As I've mentioned before, although the main draw actually starts on Thursday March 8, the big name players typically start play on that first Saturday, March 10. And that's when the Tennis Channel kicks in. From that first Saturday through the following Friday, March 16, there will be at least 8 hours of live coverage a day, starting at 8am in the east and 11am in the west. This is a great development for the Tennis Channel, for the event, and for tennis fans because in past years there has been only minimal Tennis Channel coverage for reasons that, shall we say, made no sense. So Tennis Channel is your go to default broadcast outlet for the first 6 days. To me this is great and so much simpler than say the U.S. Open where Tennis Channel and ESPN split it up from the start and you are never sure what matches are on which channel when. That type of confusion--ok it the eyes of the tournament "increased coverage"--doesn't start at Indian Wells until Friday March 16 when ESPN2 jumps as well. On that Friday ESPN 2 will "split" the coverage with Tennis Channel according to the media release--whatever that means. So remember to figure that out for yourself if you plan to watch Friday. Then after one day ESPN2 is out, and, on the weekend, big time network TV comes in for the semifinals and finals. ABC will cover the semis on Saturday March 17 and the finals Sunday March 18. That all starts at 8am in the East and 11am in California. To me it's always weird to follow an event and the various stories through one media outlet like Tennis Channel during most of the tournament, only to have an entirely new set of pundits show up at the end who weren't usually even in town for most of the event. But then I am sure the tournament is making the right decision there, at least financially. 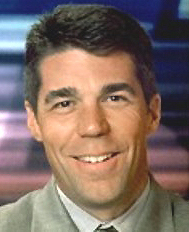 And Chris Fowler who likes our work on pro ball spin at Tennisplayer.net is on the team for both ESPN and ABC, so selfishly we can hope to get a mention there. Still if you have a busy weekend actually playing tennis yourself or (god forbid) other activities and you don't feel like clogging up the DVR, you can stick with the Tennis Channel and watch the rebroadcast of all 4 semifinals and both finals on Monday March 19. ESPN3.com: 60 hours of free match streaming. So much for TV roadcasting which is fairly simple this year. But then there is the online world which is not simple at all. As noted, Tennis Channel has the first week with TV broadcast with no ESPN2 til Friday. But if your boss let's you get away with it, you can watch ESPN3 online during that same period and see 60 hours of live matches, probably almost as much as you could see broadcast on TV on Tennis Channel. TennisTV.com: a must have for me and probably for you. BUT keep in mind, however, that ESPN3 online coverage is only through Friday March 16, ie, through the quartefinals. So you can't see the semis or the finals live online on ESPN3, although they will air on ESPN3 at some point after ABC gets through with the live broadcasts. Got that? But don't despair. There are more online and even mobile possibilities. This where we are approach the state of hyper confusion where you may need an assistant to keep track of the options. Why? Because you can see 90 tour events live online all year round, both the men and women. You can see this on your computer, and also on all the aforementioned mobile devices. Robbie Koenig and Doug Adler, TennisTV commentators who actually watch matches. 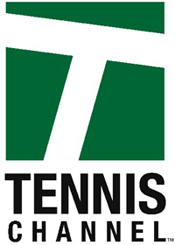 I personally subscribe to TennisTV and recommend it to Tennisplayer.net subscribers. As I've written before you could (like us) actually be covering an event somewhere in the world (or just traveling on business) and not be able to watch what was happening on TV at your hotel since most hotels don't have the Tennis Channel. So that makes TennisTV.com a must have for us--and maybe for you--even if you are just at a boring dinner party when an important semifinal is airing somewhere in the world. 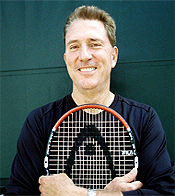 TennisTV.com is showing 60 live matches from Indian Wells, that's right 60. BUT unlike ESPN3, TennisTV will also show the semifinals and the finals live. But that is still not the end of the complexities of your online options. Let's add just one more caveat. Electronic images are great, but not as great as a warm spring day at the Tennis Garden. You just may feel the need to watch Monte Carlo in the middle of the night sometime--and that way you won't have to worry about not having that option or having to pull out your credit card at 4am. So I'm pretty proud of myself for making sense of all those options--actually made them sound pretty clear. Still I will have to say none of it compares being at the site in person on a gorgeous warm spring day in Indian Wells. And that's where I'll be. And thanks to everyone who wrote and wants to drop in and see us at the Tennis Garden and say hi. And if you haven't yet, and you want to, email me at jyandell@tennisplayer.net.